My excitement over the fact that we are now, really and truly, into my favourite month of the entire year cannot be contained. I'm buzzing with more energy than if I just ate a semi-trailer truck's worth of the very sweetest Halloween candy (alas, I haven't had a single piece...yet!). If you've been following my blog for a while now, a.) thank you immensely and b.) chances are you're well acquainted with how much I go utterly wild for all of autumn. Naturally including the gorgeous month of October, and its crowing glory, All Hallows' Eve, which will greet us again in about four weeks time. To celebrate the start of the 10th month of the year - one of, if not often "the" busiest for our family, thanks to numerous events such as Canadian Thanksgiving, multiple family birthdays (including my sister and maternal grandma's), our wedding anniversary (Tony and I will be toasting twelve awesome years together on the 14th), and of course Halloween itself - I recently had the fun idea of listing some of my very favourite elements of the season. I wanted to put a different spin on such however, to distinguish it from similar fall/Halloween centered lists, such as this one from 2013, and like a bolt of stormy fall time lightning, the idea struck me recently to do so by presenting such in the form of an alphabet. This, in and of itself, tying into the start of the school year last month and the general air of all this academic that fills the early weeks of this season. As it's Sunday and most of us are busy enjoying these final days of mild sunshine and accompanying warmth while they're still here, I didn't want this post to be a huge one by any means and have thus opted to list each entry - which speaks for itself, I feel - simply with with its name, a few further words at most, and an accompanying vintage image. There are truly countless things to love about fall and this selection of twenty-six entries is the mere tip of the iceberg, but they're some of my perpetual favourites and one that I know are near and dear to many of hearts as well. So without further ado, may I present an alphabetical look at some of the best elements of fall. 7. Goblins, ghosts, and ghouls of every sort! 11. Knits - sweaters, scarves, gloves, you name it! 24. (The e)Xcitement of Halloween! 25. Yellow, orange and white - the traditional colours of that sweet fall time treat, candy corn! In a way, I want to say that this week is like the calm before the storm of epic activity that will unfold throughout the month, but in reality, it's already hopping with excitement, full days, and plenty of festive happenings - and you know, I really wouldn't have it any other way. From my earliest childhood memories onward, October has been a busy, exhilarating time of the year and as someone who really loves to focus on family, tradition, and holidays, this month and its festive happenings brings me an endless amount of happiness. I hope that it does the same for you as well, no matter what's on your (slice-of-Halloween-cake topped) plate this month, and that you enjoyed this fun alphabet post. It's a charming way to roundup some of the elements that one treasures the most about a given season and I'm now, quite literally as I type these very words, wondering if perhaps I should give one a go for winter/Christmastime, too. Definitely let me know in the comments below if you'd be keen to see such here as well. My sweet and wonderful friends, from my heart to yours, I wish you each a gorgeous, thrilling and very merry month of October - which I can hardly wait to celebrate again with you from start to spooky costume clad finish! Fabulous! Let the fun begin! Thank you very much, sweet Kate. I had a blast bopping around the web tracking them all down. It's such an iconic, wonderful costume. 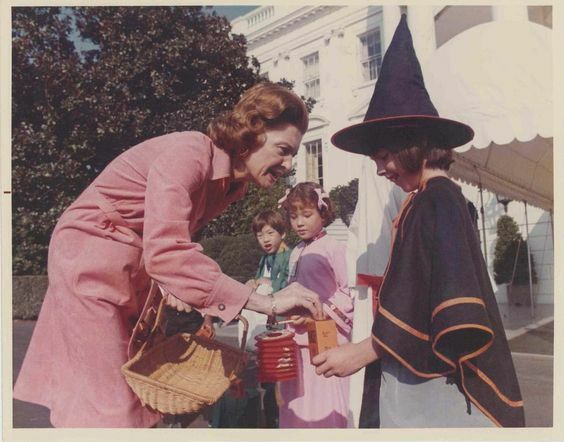 I've gone as a Halloween witch numerous times throughout my lifetime, including twice under the age of twelve. This week, on Monday, I finally nailed down my (as did Tony, his) costume choice for the year. I'm thrilled about it and look forward to sharing snaps of it here in a few weeks time. Many hugs & happy Halloween season wishes! So many beautiful fall and Halloween graphics. You want me to pick one? How 'bout top 3? Hmmmmm, I really like the gal bobbing for apples, the gal going up the staircase with candle in hand and the fashion diva with the orange dress! WOW! I just started decorating for Halloween, my fave holiday. Takes me a couple days. Thanks for sharing such inspiring images. My absolute pleasure, dear Tam! Same here! This year my mom is planning to by 'round to help with the bulk of my Halloween decorating and we're going to make a whole fabulously festive day of it. Many hugs & happy All Hallows' Eve season wishes! October is my favorite month of the year! Love this collection of vintage autumn pictures! That's awesome! It's mine as well and, I swear, it does so very much to help me get through the others. The joy that October brings my way is unparalleled and something I hope that many others get to experience themselves as well. Here's to a fabulous favourite month! Absolutely, Laurie, please feel free to give this fun post a spin of your own. I'd be delighted to read your answers and see what images you include with them. I love Halloween and autumn! This year, I couldn't even wait for October to change my blog over to the Monster template, and did it on the last day of September. I've been having a lot of fun virtually collecting vintage Halloween cards and pictures, and thematically-related images, over the last few weeks. This year, the Halloween season coincides with the High Holidays month, and the concluding holiday of the first month of the year, Simchat Torah, is less than a week before Halloween. If I'm still in NY and not forced to move after Halloween (long story), I'll also be celebrating with the pre-NaNoWriMo kick-off party with my local writers' group. We're encouraged to come in costume to the kick-off party. That sounds like a lot of fun (save for the potential move situation; I'm sorry that you suddenly have that on your plate) and such a delightful way to celebrate the 31st. Wishing you a beautiful month on all fronts from start to finish. Yay! Three cheers for those on "team October". :) It really is an incredible month. So beautiful, so exciting, and so filled with delicious treats (especially for us here in Canada, who celebrate Thanksgiving this month, too). Wishing you a stellar October!!! Bats are the best!!! I'm a huge fan of them as well - very much including when they appear in fashion form. An interesting and ingenious article! We are approaching our favorite holiday! A time of year when light and darkness meet and create such beauty and charm! And then the fun and sweetness of a slice of chocolate cake .. You made a really lovely selection, each image is really perfect to represent this mysterious period and fun .. Here in Tuscany the days are still very hot, even if sometimes begins a sudden rain, especially when I just brushed my hair ... See, time has already started with tricks, I feel a little 'sugar ! see you soon my dear! What a delightful way to look at Mother Nature's moods this month, dear Serena. It really is exciting that this elegant and lively chapter of the year is here once more. I'm in my element on so many levels right now and haven't felt this happy in quite a while (even with no less than a million things weighing on my mind and heart alike at the moment). It's a welcome treat and a hugely appreciate occurrence before we launch into a long, snowy Canadian winter. Gosh, do I hear you there. Never in my life have I experienced a damper summer (and second half of spring) than the one that we just had. Part of me still feels like I'm suddenly going to wake up at the beginning of May and we'll have the whole sun-kissed summer to look forward to. Yay, not so much. ;D Hopefully next year's will be absolutely worlds warmer and drier on both our ends. A single year like this is one thing, but two or more in a row would nearly have me packing my bags to move to somewhere near the equator!!! Wishing you a thoroughly lovely, not-too-chilly autumn, my dear friend. Isn't she just magnificent? I want a copy of her costume soooo bad! :) If only some of the repro companies would look to vintage Halloween costumes of the past and replicate 21st century version of them for us (how incredible would that be?!). Yay for Fall! Yay for Thanksgiving this weekend :) What a great post to kick the season into high gear. Enjoy the season Jessica and have a wonderful Thanksgiving with your family this weekend. I love it though, don't get me wrong, and am looking forward to celebrating another beautiful holiday with our family. With all my heart, I wish you, your husband and all of your loved ones a peaceful, joyous and very fun filled Thanksgiving celebration. I also have goo memories from early childhood and Halloween parties, that went through to adulthood :) I like it so much and I can feel how you are excited about it, dear Jessica! And congrats for your anniversary with Tony! Also, nice to have Canadian Thanksgiving, sister and grandma's birthdays, all in October. What I like, the leaves... orange color, Jack-o-lanterns, candles, all so sweet! And popcorn, yay! I loved the Unicef boxes, it's really a great idea! Charity is always so important! I am eager to see your costume :) Hope you have a very nice new week! Hugs and regards! Those are fantastic elements of the season to adore, dear Denise - popcorn very much included. There's just something about the moment when the first note of cold hits the early fall air that makes me want to practically turn this classic snack into a food group unto itself (especially when it's consumed alongside a crisp, juicy fall apple). Thank you very much for your wonderfully nice comment and lovely wishes. May this October be one of happiness and fun aplenty for you! Candles! I love the crisp days of autumn, and those chilly days where all you want to do is curl up with a good book, some delicious tea and chocolate with a nice wood fire burning, and a lovely scented candle because it is cold, wet and storming without. Aww, that's so awesome of you to say, darling gal. Thank you to the (harvest) moon and back. I swear, I'm already having a tricky time sleeping some nights because I'm that excited for Halloween, and really, just to savour my favourite month of the year in general. It's fabulous that you're a big fan of this season, too, and that a lot of these points really resonate with you. Wishing you an endlessly fun filled, beautiful month! I'm ready for it! I especially wish to go on a hay ride looking that glamorous! Happy Autumn! Wouldn't that be an absolute blast? There are, IMO, far too few hayrides around still in a lot of places (I don't know of any offered in our town, for example). They - like sleigh rides in the snow come wintertime - are such an iconic element of the season and one that I'd imagine, us vintage adoring folks are extra keen on. I hope that you're able to take a hayride this autumn, dear Karen. I can feel your excitement for your special day coming up Jessica ! I love seeing old ads and pictures, in this case, the one of the girl making pop corn treats, she is so immaculate and I cannot imagine this task being hassle, sticky and mess free ! Very true! Especially since I would venture to guess that she's dipping those balls into a bowl of corn syrup tinted with food colouring (as we used to make similar popcorn balls of that nature when I was little and the bowl of "topping" looked nearly identical). If not, then likely a light caramel sauce. Either way, definitely a lot of potential for mess - which might be why she's holding the popcorn ball so gingerly and away from her lovely outfit. Thank you very much! I'm definitely at max giddiness right now and am so enjoying savouring each day of this beautiful, exciting month. I hope that October is fantastic month for you as well, my sweet friend. today we ate our first pumpkins of the season - cold pouring rain outside and candles lit in the house...... hello fall! That really does sound like the perfect way to usher in the nippy, exciting Halloween season, dear Beate. I've started cooking and baking with pumpkin again on this end, too, and am tempted to eat it everyday (as I love it that much :)). With Canadian Thanksgiving this coming weekend, more will definitely be on the table then. That sounds like such a nice sweater. Just the thing to help fend off the encroaching chill that's upon us again. I do like the colourful vintage knits! I came across a blog that showed how to take a modern sweater and make it vintage...remove the sleeves and reattach them. I thought I saved the page, but I can't find it again. Maybe someone knows the blog? That is such a cool sounding link! I haven't encountered it yet myself, but if I do, I'll be sure to share it here. I did find the sweater link from 2013 on Brittany's blog, Va Voom Vintage. Guess what...you even commented on it! I hope it is ok to post the link here for anyone interested. Has anyone tried this? Thank you very much for coming back to share it here. You're so sweet! It would be great to hear from anyone who has given it a spin, I agree. There really is, I completely agree. It's such a lively, enthralling time of the year. Thank you sweetly, my lovely friend. I'm delighted to know that you enjoyed this fun post. It has definitely been one of my favourites of the whole year so far to pen (and gather images for). Eloquently and wonderfully said, dear Emily. Your lovely comment really made me smile, as I too fell madly in love with the past as a child and know that certain older books (from Anne of Green Gables to The Velveteen Rabbit) played an important roll in the development of my passion for the past. Yes, the real world might not be as idyllic as a children's story, but we can still help to make it more enjoyable via our vintage leanings and respect for days gone by. Such a pretty post, full to the brim of wonderful images! Coxs apples are in the shops right now, they are ridiculously delicious and smell heavenly, I can't get enough! Lovely British apples, yum, yum, yum! They really are a fabulous variety of apple. If memory serves me right, I tried Cox, Braeburn, and Pink Lady apples all for the first time when we lived in Ireland and have been hooked ever since (luckily these days we can find at least some of those around these parts come fall/winter). A fabulous fall A-Z list... I just wish I could pull off that bat costume, ha ha! Happy and healthy Fall to you, Jess! Wouldn't it be amazing to wear this costume or one akin to it? I - as I'm sure many in our community do - so wish that some of the repro brands would offer up 21st century versions of thoroughly mid-century looking Halloween costumes. I suspect, if reasonably priced, that they'd fly off the shelves. Thank you very much, Jackie dear. I hope that your autumn is a joyful, fantastic season, too. What a cute and clever idea for an autumnal blog post! Thank you very much, my dear. It was sooo (!) much fun to put together. I really hope to do one for Christmastime, too (if not this year, than at some point down the road). Seasonal ones, say for spring and summer, could be a delight as well. Aww, that's so sweet of you to say. We definitely are two peas in a Halloween adoring pod. Love that so much! It's awesome to share in our mutual enthusiasm for this fabulous holiday from across the miles. Oodles more festive posts are on the horizon this month - including an ode to my all-time favourite fictional couple (to tie into mine and Tony's wedding anniversary). I love that, too! I have multiple plastic totes of Halloween decorations and completely delight in bringing them up from the basement and digging into them for the first time in nearly a year as well. It's definitely one of those moments that's worth toasting about this beautiful season. That sounds like a wonderful way to spend the day. I'm starting to think about Christmas already, too - there's only about 2.5 months to go (it will get here at the speed of light, I'm sure). What special memories, sweet Elizabeth. Thank you very much for sharing them/us with us. It's awesome that your family spent time in the US and got to experience the North American take on autumn and Halloween. Did you carry some traditions home with you to help celebrate this fun holiday?